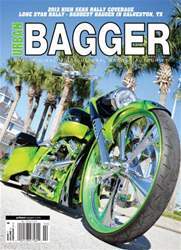 This issue has 4 mind blowing custom baggers along with event coverage from the 2013 Lone Star Rally, the 2013 High Seas Rally, and the 2013 Baddest Bagger in Galveston Texas. Buyers Guide on Fenders, Sheet Metal, Saddlebags, Lids and Latches help you pick the right look for your bike. Tech stories include Metal Rescue Rust remover, Barnett Clutches Stealth cables and American Drag Seats Custom Bag Lids.